After a long awaited return to Liberia, ExxonMobil started drilling at the deepwater Mesurado-1 exploration well earlier this week, according to partner Canadian Overseas Petroleum Ltd. (COPL). Map of Liberia, from COPL. COPL, along with ExxonMobil E&P Liberia, an affiliate of ExxonMobil, spudded Mesurado-1 on 22 November 2016, using Seadrill's West Saturn drillship. The well is about 50mi offshore Liberia on Block LB-13 in some 2500m water depth, and is targeting oil in Late Cretaceous sands. Block LB-13 comprises more than 2500sq km and is in water depths ranging from 250-10,000ft. The Block is 18mi off Liberia’s central coast. Mesurado-1 is the first well operated by ExxonMobil offshore Liberia. With an estimated cost of US$120 million, the Mesurando-1 well’s primary goal is to prove a commercial quantity of hydrocarbons in the Cretaceous Santonianage reservoirs. Mesurando-1 is also expected to provide calibration for the seismic response, which the JV can use to evaluate other leads on the block. In 2010, 3D seismic of the area showed similarities to deepwater oil discoveries made offshore Ghana and Sierra Leone. After an independent reserves evaluator conducted a gross prospective petroleum resource report for the block, 13 top prospects were chosen to derive a statistical aggregate number of 2.6 billion bbl of gross recoverable oil at the P50 (best estimate) probability level. The partners delayed drilling plans off Liberia on 23 July 2014 due to an outbreak of the Ebola virus that began in March 2014, however, in late-2015, the duo made plans to return to the region. During the first part of January 2016, the World Health Organization declared the end of the most recent outbreak of Ebola virus disease in Liberia and stated that all known chains of transmission had been stopped in West Africa. However, there remains a risk for further flare-ups of the disease, which have the potential to be serious. 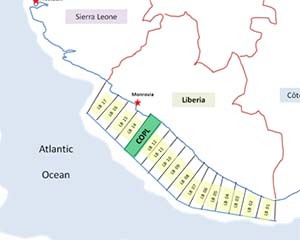 On 23 February 2016, ExxonMobil informed COPL that the length of the extension period granted by the National Oil Co. of Liberia (NOCAL) had been set at a total of 619 days and that the second exploration period timeframe has been extended until 25 September 2017. This extension was a result of the “State of Emergency Agreement” between NOCAL and ExxonMobil due to the Ebola crisis in Liberia. Exxon is the operator of Block LB-13 with 83% stake; partner COPL holds the remaining 17%.